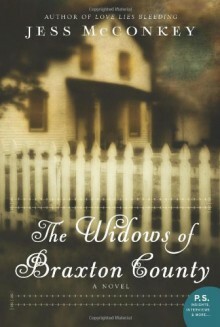 Widows of Braxton County by Jess McConkey is a haunting and suspenseful novel about family secrets and how well we really know the people we love. Kate is looking forward to starting a new life with her new husband, Joseph Krause. She leaves the big city and moves with him to the Iowa farm that has been in his family for more than 140 years. Instead of something out of Country Living, Kate finds life on the farm a struggle. She hears gossip from the unfriendly neighbors about the connection between the Krause family and a mysterious death decades before. As the past creeps into Kate’s present, she’s caught in a web of dangerous, unexplainable events. Jess McConkey, who is also published under the pseudonym Shirley Damsgaard, is an award-winning writer of short fiction. Full review in progress.+Great storyline with a feeling of really amateurish writing. + There were aspects of the story that I think were too easy or simple.